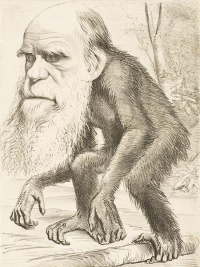 As "Darwinism" became widely accepted in the 1870s, good-natured caricatures of him with an ape or monkey body symbolised evolution. Transitional fossils are the fossilized remains of transitional forms of life that illustrate an evolutionary transition. They can be identified by their retention of certain primitive (plesiomorphic) traits in comparison with their more derived relatives, as they are defined in the study of cladistics. "Missing link" is a popular term for transitional forms. Numerous examples exist, including those of primates and early humans. According to modern evolutionary theory, all populations of organisms are in transition. Therefore, a "transitional form" is a human construct of a selected form that vividly represents a particular evolutionary stage, as recognized in hindsight. Contemporary "transitional" forms may be called "living fossils", but on a cladogram representing the historical divergences of life-forms, a "transitional fossil" will represent an organism at the point where individual lineages (clades) diverge. Unless indicated otherwise, the text in this article is either based on Wikipedia article "Transitional fossil" or another language Wikipedia page thereof used under the terms of the GNU Free Documentation License; or on original research by Jahsonic and friends. See Art and Popular Culture's copyright notice. This page was last modified 10:56, 23 November 2013.